This just keeps happening & so far I havent found an explaination. 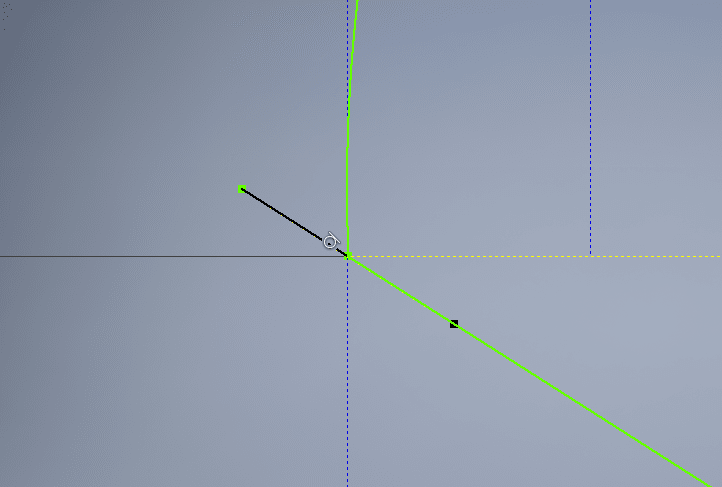 I create a spline & activate the spline handles at the begining of the spline but they just wont move even if I remove all constraints, still they wont budge, see picture. This seems like a very basic operation yet I can not for the life of me work out whats going on! I know its bad form to make comparisons with other software but this kind of thing is childs play in Solidworks. The endpoints of the control handles seem to be constrained to the diagonal sketch line. With two endpoints, you'll have to manually select each one (possibly requiring "select other..." to do it) and verify that all constraints on both endpoints are deleted. Another strategy is to create the spline but to NOT attach the final (or starting) endpoint to any other geometry. Dropping it in space will prevent most implicit constraints from being formed. Then attach it to the other line(s) with only the constraints you want. If you are a SW user, then sketch line creation does some counter-intuitive things in Inventor. You can change the implicitly created constraints, or stop them from being created altogether, with the application options under the Tools ribbon tab. As an aside... Depending on what I'm doing, I'd like to sketches to create lines that are "parallel/perpendicular" and at other times I'd like them to be "horizontal/vertical", but I can't find a way to toggle between the two behaviours, except for opening the options dialog box, sketch options, and choosing each of the constraint options I want. SW certainly gives you much more control over splines. It seems I have joined the SolidWorks brigade (new job). It will be my turn to ask questions, soon.